We’re delighted that our home Brooklyn neighborhood of Dumbo (aka Down Under The Manhattan Bridge Overpass) has seen a rapid incline in population and development over the past 10 years. And according to The New York Times, the expansion isn’t slowing down anytime soon. Profiling the neighborhood in the real estate section of last weekend’s paper, the Times notes that Dumbo now houses some 4,000 residents and a whopping 10,000 office workers (hi neighbors!). When we first opened our offices here, Dumbo was just starting to gain it’s footing as the go-to neighborhood for New York’s tech industry. It should come as no surprise that since then, the area quickly became known as “Digital Dumbo,”. As the Times points out, DUMBO wasn’t always this populace. 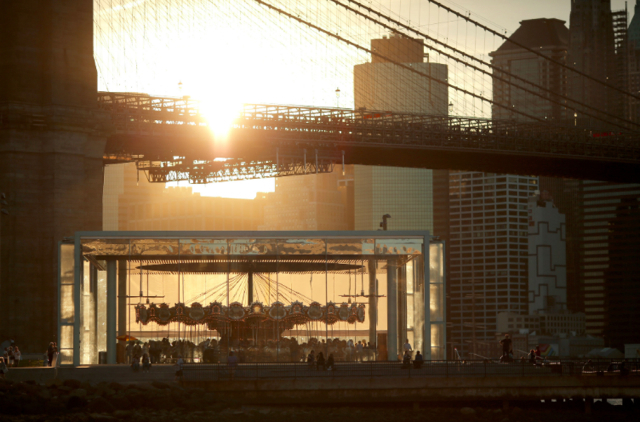 But over the last decade, Dumbo’s once desolate landscape has transformed to a teeming waterfront playground. And its now familiar acronym, which stands for Down Under the Manhattan Bridge Overpass, has become synonymous with some of Brooklyn’s most expensive real estate, with a median sales price of $1.5 million through July, according to Streeteasy.com. Our offices have been here since the start of the company, so we couldn’t be more pleased to see this beautiful neighborhood get the attention it rightly deserves. Click below to read more about the past, present, and future of Dumbo.